Please join us to vote on next year’s candidates for Friends of Hawthorne PTA’s Board of Directors. Child care and kid's pizza dinner will be provided. Please let us know if you need any special accommodations to attend, including translation or disability services. We want everyone to feel welcome. 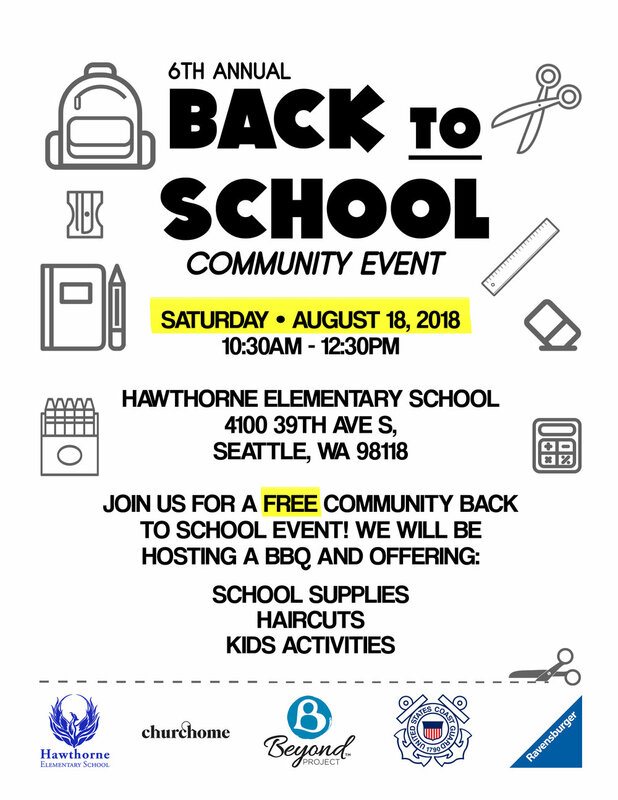 For more information please email president@friendsofhawthorne.org. For families of Grades K-12. Free Dinner, Raffles & School-Aged Childcare! Books available to purchase during the school day or after school on Thursday. Please join us as Friends of Hawthorne PTA’s leadership approves the slate of candidates for our 2019-20 Board of Directors. There will also be a Q&A with teachers. Child care and kid's pizza dinner will be provided. Please join us for REGISTRATION NIGHT! Classes are first-come, first-served; some classes may fill quickly! All students are welcome to apply, but preference will be given to students that are below grade level as determined by: classroom based assessments, MAP, and /or SBA. All current 5th - 7th graders are welcome to apply, but preference will be given to students that are below grade level as determined by: classroom based assessments, MAP, and /or SBA. See flyer for more information on how to RSVP. January 29th, 2019 5:00-7:00 PM. Meet and greet with the teachers, connect with fellow parents, tour the classrooms and learn a bit more about everything that kindergarten at Hawthorne has to offer. Kids are welcome. Enter through the main doors of Hawthorne. Kindergarten Rooms 1, 4, and 5 will be open and ready for you! If you'd like more information or have questions contact Kindergarten teacher Jennie Manzo at jlmanzo@seattleschools.org / (206) 252-7258. Wear your costumes and enjoy an evening of fun! *All proceeds raised will directly benefit the children at Hawthorne Elementary. Plant trees with us on Arbor Day! Playground Groundbreaking Celebration and Volunteer Work Party, 9 a.m. - noon - This will be the first of four quarterly volunteer work parties throughout the year. We will begin planting the new trees for our playground! This will be the first of four quarterly volunteer work parties we'll hold throughout the year. More than 250 community members came together last year to create a shared vision for transforming Hawthorne's asphalt school yard into a tree-filled sanctuary with diverse play and learning opportunities. Design plans are in place now, and we are excited to start the transformation. This will include the construction of a creative play area, the beginning of the "creek" running through the playground, new sitting areas, a new entryway to 39th Ave, and planting of over 25 new trees. Construction will begin in late spring. Walkathon, during school hours, Hawthorne and the walking path around Gennesee Meadow - Hawthorne students will walk 1.25 miles to raise both money and school spirit! The money raised will support our school STEAM program (Science, Technology, Engineering, Art, & Math). The first Friends of Hawthorne (FOH) meeting of the school year will be held Tuesday, October 2rd, 6pm-7:30 pm in the Hawthorne cafeteria. Child care and kid's pizza dinner will be provided. Pre-orders will be taken from September 27 through October 31, 2018. Pick up date will be Thursday, November 1 at Hawthorne’s Día de Muertos (Day of the Dead) from 6-8pm. Individual orders available night of event until sold out! DOWNLOAD YOUR ORDER FORM TODAY! Please join us Tuesday, 9/4, at 5:30 for a Potluck Play date at the Rainier Community Center Playground. Beverages will be provided. We look forward to meeting your family and making new friends. See you there! August 20* to 24, 2018 9 a.m. to 12:00 p.m.
*There will be a parent meeting the first day on Monday, August 20th at 9:15a.m. Hawthorne's kindergarten teachers and a mix of other fantastic Hawthorne staff will be running a free week of Jump Start kindergarten. The purpose of this week is to introduce students to the staff, building and expectations of kindergarten in a relaxed atmosphere without older students around. Students will be taught by each K teacher and will have a chance to meet new kindergarten friends. Participation in Jump Start is strongly encouraged for all incoming kindergartners. Children who have been registered for kindergarten are automatically welcome to attend Jump Start. Fill out the Jump Start Registration form and return it to Hawthorne bu June 22nd, 2018. See the School District page for more information on Getting a Jump Start on Kindergarten. This program is being offered through the Early Learning Department of the Seattle Public Schools. Rise Up and Dance, Again! The Second Annual Hawthorne Family Dance is next Friday, 6/8, from 5:30-7:00 PM in the gym. Molly Moon’s is providing ice cream and a Hawthorne parent, DJ Guy, will help us get our dance on. Please join us! Que? Invitación a todas las familias de Hawthorne para un baile y nieve, todo gratis! Organizado por la Familia Moon y música del DJ Guy. An Evening of Food, Performance, and Learning! Wear your cultural clothes! Potluck Event! Bring your favorite main entree to share (15 servings)! Zumba, Free Dinner, Prizes, Community Partner Stations! Come join us for a night out with your family! Story time, crafts, games, and free books for reading fun with your family!!! FoH Book Fair Sale! The Book Fair is also Online! Be a part of the redesign of Hawthorne's playground! Join us as we present different design concepts. Everyone will have the opportunity to share feedback and ideas so that we can create one single focused master plan. Dinner will start at 5:30pm, the meeting at 6pm. What types of new elements are most important? Adventurous play elements, quiet sitting space, paths and exploring spaces, loose part play, digging areas? What is the best place for ball play? What do we envision for the future of the garden space? How can this space best celebrate our diverse community? This is a SUPER important meeting. We are thrilled by the large turnout at out first meeting in late January. This time, we’re hoping for even greater numbers and a diverse cross-section of our community that represents Hawthorne’s rich mix of cultures and backgrounds. If you have any questions, please don’t hesitate to email Playground Redesign Lead Peter Schumacher at schumacher.p.j@gmail.com or call/text at 206-683-9367. Third Place Books Seward Park and Raconteur are proud to support our local schools and community organizations. server at checkout that you're Giving Back. Pick up a great read (or three) and help raise funds for Hawthorne Elementary. *Excludes newspapers, magazines, & sale items. Cannot be combined with discounts. Ms. Nowell's class's performance will be Friday, March 9th at 1:30pm. This play is about students who encounter a magical copy machine that sends them on a time travel adventure inside Greek Myths.